Also, if you want to rotate object to duplicate. Select object, goto Rotation Angle in Transform Panel/Control Tool Bar enter value, and hit Alt (PC) / Opt (Mac) + Enter. This feature does not work when changing object dimensions by dragging object handles (Alt/Opt key is reserved to lock resizing object from center) and when using Free Transform Tool (E). And for the end, few Bonus tips! 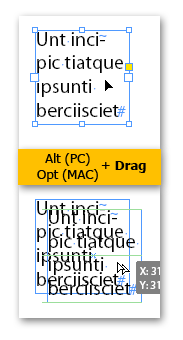 By adding Shift key to Alt (PC) / Opt (Mac), InDesign will automatically reselect whole input field. 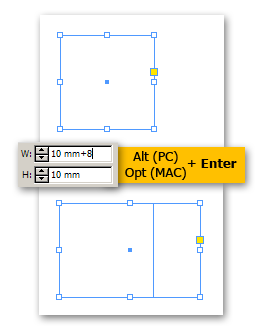 By adding Ctrl (PC) / Cmd (Mac) key to Alt (PC) / Opt (Mac) while editing object size or scale, InDesign will automatically do resize/scale like you have turned on Constrain proportions. That’s it! At the end of the post you can find some examples (screenshots) if you need any! PS. Try using Transform Again or Transform Sequence Again after transforming to duplicate! You can get pretty cool effects! 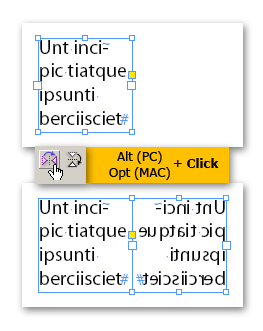 This entry was posted on Wednesday, January 5th, 2011 at 23:34	and tagged with duplicate, InDesign CS4, InDesign CS5, transform and posted in InDesign. You can follow any responses to this entry through the RSS 2.0 feed.